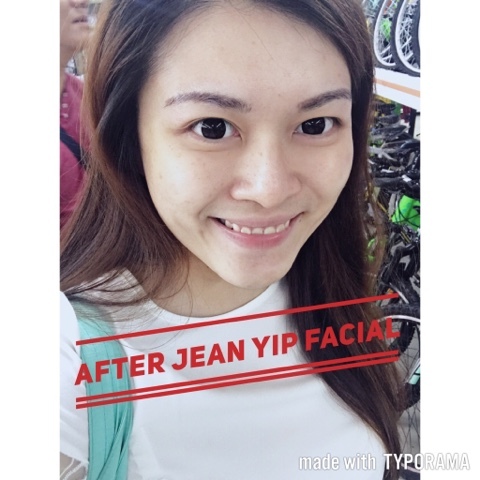 Finally I am going to write my Facial Experience in Jean Yip. I decided to write about this.My friend intro me to Jean Yip when she saw the Promotion of two Facials for free back in 2015. I was very interested in getting rid of my acne face so i decided to give it a try. I went to the nearest branch and they gave us two times of complimentary facials which is really doing magic to my skin. Instant brightening and of course less obvious of my face which is better than outside those HDB saloon. R6 Facial Treatment: The R6 Plus Customised Face Treatment is useful for people who have terribel skin and you can see instant result. Before my facial, my skin was cleansed by the therapist. Then, therapist will use a Dermasonic machine that uses galvanic technology to remove my dead skin so it is easier for moisturizer to absorb later. My skin is super dry therefore all extraction will be painful and damage my outer skin protection. And then they will steam and extract my blackheads followed by eyebrow shaping. Later they put on some ampule followed by a cold pressured pen was used to ensure it was well absorbed into the skin (i believe its what they called ‘Transdermal Administrative System’ )to ensure all the nutrients in the solution penetrate into deeper layers of your skin. Finally, they put on some hydrating seaweed mask to calm my skin and remove the redness. After 15-20 mins, therapist will use warm water to cleanse my face and follow by some basic skincare routine– toner, moisturizer and sunscreen. The last step of my facial was a relaxing but relatively short shoulder massage. Verdict: Quite impressive but the facial treatment price is quite high. You can see instant result but it is not lasting. But their price is quite high when they introduced me their package and i believe one facial is around 200+. At that times, I feel bad since the beautician is pregnant and she did quite well for me and I am thinking to buy her maybe one or two sessions to support her. I bought my package in 2013, the price is 260 per session but after i negotiated with them they offered me some free eye mask and hydrating facial. Normally after the session, the sales manager, ahem* comes in and tell me your skin is in deep trouble if you neglect them. Blah blah and you need to maintain them and even young girls come to us for help etc.You need to use your super negotiating skills to negotiate and let them give you time to think. I believe Jean Yip is case trust so they can allow cool off period to let you consider but its always hard to reject as they will look at you enthusiastically. P/S: I went to Jean Yip at Parkway. Beware of gst, the price listed is always before gst, you will need to add in the 7%.